McDonald’s and Bud Light are both introducing ad campaigns that draw attention to messages on top of their branding icons. With Bud Light, the messages pertain to their boisterous “Up for Whatever” campaign with so-called “invitations” to go for it when it comes to having a good time. On a more personal level, McDonald’s is using the real estate on their myriad Golden Arches to welcome home soldiers or congratulate a local high school’s football team. I have no qualm with doing this. As a matter of fact, I kind of like the idea – even if it’s nothing new putting cute and clever notes on packaging or storefronts. Starbucks has done it. 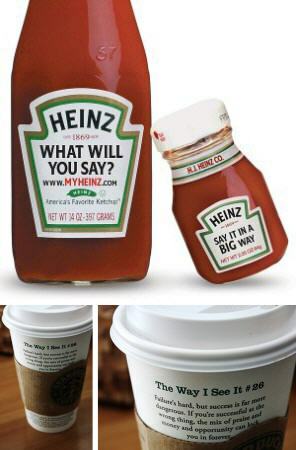 Heinz Ketchup has done it. Wheaties pioneered the scheme by putting lesser-known athletes on their iconic cereal boxes. All of these efforts are attempts to customize the brand experience with consumers. Like I said: no qualms. In the age of social media, personalizing brands only makes sense. My beef is when brands advertise that they’re doing it. It seems to me that drawing attention to such personal messages ruins the surprise. They are Easter eggs not copy points. Pointing them out in national TV commercials totally takes the personalization out of it. In my opinion, it ruins the surprise and diffuses the charm. Moreover, it strikes me as grandiose, maybe even crass behavior. There is an old spiritual axiom that suggests good deeds are truly sincere when they are done without taking credit. And while I’m not suggesting advertising has or should have a spiritual side, I am saying that these sorts of messages are far more effective – sincere, if you will – when the consumer discovers them. Not pointed out. Furthermore, there’s no need for it. Chinese restaurants don’t advertise fortune cookies, they just bring them out after the meal is served. People love getting them. When Bud Light spends a ton of money marketing silly messages on their bottles, it suggests to me that the brand has nothing better to talk about; which, in their case, is probably true. The McDonald’s case is less egregious in that the Golden Arches have always been used to brag about “Billions served.” The personal notes are welcome respite from grandstanding. The commercial is sweet. Still, the Hallmark-like TVC is trying too hard for our heartstrings. The loving notes jive with their “lovin’ it” campaign, but when broadcast as reasons to believe in said “love it” diminishes the gesture. Wouldn’t it be a lot cooler and more effective if these messages were seen in “real time” and not promoted in prime time? Steffan joined gyro in February 2012 as executive creative director of the San Francisco office. Before gyro, he was Chairman and Chief Creative Officer of Euro RSCG Chicago. He is best known for his iconic work on Altoids, The Curiously Strong Mints. He is also co-wrote “Not Your Father’s Oldsmobile” and Heinz Ketchup’s “Worth the Wait.” Postaer has won virtually every major industry award ranging from Cannes Lions to One Show pencils, Addys, Obbies and the NY Festivals. He was also chosen as one of “40 under 40” byCrain’s Magazine. Postaer has written three books including “The Happy Soul Industry.” He is an avid blogger at Gods of Advertising and an accomplished speaker having appeared at Cannes, AAAA, the University of Chicago, Northwestern School of Journalism, Kraft Marketing Conference and other high-profile engagements.